Just two days before the race, Grandma’s Marathon was looking less likely for me. Rain kept drenching the farm making nearly every chore take longer, and several employees had problems come up that made scheduling dicey. Obviously the animals must be cared for when we’re away, and I’d resigned myself to staying home if I needed to. Maybe this redemption marathon just wasn’t meant to be. My husband, who is usually more creative about these troubles than me, eventually got everything organized so we could head to Duluth on Friday night. I’m grateful to our people who worked an extra day or long shift to make it happen. Anyway, we dropped in at the farm and saw cows, sheep, and eager dogs, plus great people. 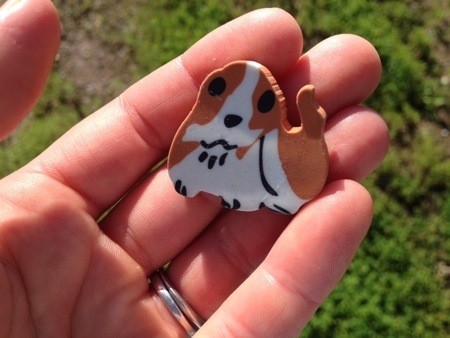 John’s small niece was busily playing with something, which she proclaimed to be “re-raysers.” She was clearly pleased with the small dog-shaped erasers, so I was surprised when she handed the brown and white one to me. It immediately reminded me of my Calvin, with a round, brown back and white feet. She said she wanted me to keep it, and her dad said the e-racer would be good luck for me, the racer! They knew I was in town for Grandma’s, and I appreciated this sweet gesture. I left JR with John for the evening, and I drove back south to get my race number and stay with my cousin in Duluth. While driving I chatted with one of my sisters who wished me luck. She also reminded me that true strength comes from God. I’d been reminded of that poignantly during my last marathon, and it was just what I needed to hear that night. I also thought about how fortunate I was to even be there. I’d felt addled during the hectic week, but once we got on the road I just felt grateful. A marathon for fun is a non-existent luxury for billions across the world, and I was about to do my second of the year. I had an opportunity, and opportunity is not insignificant. Duluth was COLD, 48 degrees, when I stepped out of my car, and I said a silent thanks for the weather. (It had been in the 80’s when we left home.) The North Shore usually does remain cool well into June with Lake Superior working its chilly magic. A 10:30 bedtime was later than I planned for, but I still had a hard time falling asleep. By 4:30, I was up for good. It was race day. My cousin (who went on to run a 3:33!) 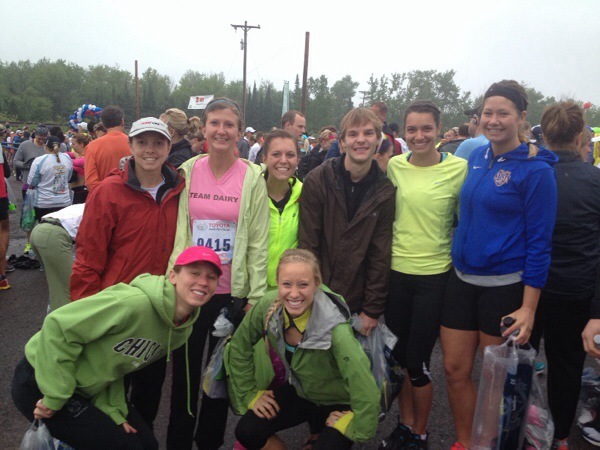 and many of her friends were running the marathon, and we caught an early bus up to the start at Two Harbors. It was foggy and lightly misting, but no real rain ever showed up. A 50 degree start meant we were cold while waiting, but I knew it would be better as soon as we got moving. I had plenty of gels and more bananas packed than I’d ever need, so I organized the fuel I wanted in my pockets and under my hat. I put the rest, along with my light windbreaker, into my gear bag to check. Shorts, tank top, and gloves it would be. The fog was thick enough that we couldn’t see the lake, but I knew it was just off to my left as I finally crossed the start. I promised myself I would run an easy first few miles to warm up and then settle into goal pace. I did stay comfortably behind the four hour pacer for the first few miles, and then I forgot to notice where she was for awhile. I found a new running buddy about two miles in, and for several hours we talked jobs, running, kids, pets, and hydration. Sometimes I wonder whether it does use too much energy to chat with people, but I really can’t help it. I love the human interaction and sharing the race with others. As the miles progress I get more quiet, but talking makes the early miles so enjoyable. We both had our eye on 3:59, though she said it would be a larger stretch for her. About mile six we randomly wondered where the four hour pacer was. I knew we were running almost exactly on pace, but I still got nervous thinking we might be behind. We picked it up a little, but when we passed 10K in under 56:00 I was certain we were ahead. The weather continued cool and overcast, and when we passed right next to the shore a cold breeze would prick the goose bumps up on my arms for a minute. In spite of that, I felt it was nearly perfect temperature. The morning was still, and it was nice not to fight the wind. Spectators were few but lively during the first half, which we came through just under 1:59. I was satisfied that I hadn’t gone out too fast, but I was nervous about my ability to stay strong in the second half. There wasn’t a lot of cushion. I continued to run with my friend, and about mile fifteen it suddenly got really crowded. We realized the four hour group was upon us, and we were fighting for every inch of elbow space. Feeling claustrophobic, I started blazing a path forward. She followed, and we were back ahead of the group for a few more miles. Somewhere around mile twenty we got separated. We’d talked earlier about each running our own race, and I knew no matter what she was on track for a big PR. Now it was just me. I’d had in my iPod since mile seventeen without paying too much attention to it, but now I was really hurting. Even my ankles and the vertebrae in my lower back were sore. I tried to muster positive thoughts, but I knew I was slowing down. For a few minutes I thought this was doomed to be another repeat of “almost.” The crowds were getting larger and the cheers louder, but that didn’t make my legs move faster. Then, Amarillo Sky started playing through the one earbud I had in. My playlist was an eclectic mix of pop, rock, Latin, praise & worship, and classic rock, with only a little country thrown in. This song surprised me but was exactly what I needed. If you don’t know it, the songs talks about a guy working his farm land and sending up another prayer for his dreams of prosperity for his family. It wasn’t a peppy running song, but I’d added it a few days ago because it reminded me of friends and college days. During the marathon I felt like I was soaking in the words for the first time. I thought about all the people who work hard everyday with little reward (in all sorts of jobs) and how strong they are. I was again reminded of my opportunity to run and how I owed it to my family, my friends, and myself to make the most of it. I thought about my mom and her failing eyesight. Even though I didn’t have a sign on my back this time, I was still running in honor of her at heart. I even thought about the many generations of my family who have farmed the land and how they’ve always put their trust in God. The race was no longer just about running. I had a renewed purpose; I had a choice. I could pick my knees up a little higher, try to run a little faster, and see what happened. I wish I could say after this I was so inspired that the final four miles were a breeze, but … absolutely not. They continued to be a battle. I was feeling stronger mentally, but physically, of course, my body was getting more and more fatigued. The closer I got to the end, the more I hurt and my brain demanded to stop. I knew I would keep going and finish, but I was tense as I thought about how every second counted if I was going to beat the clock. I didn’t slow down for water the final two miles because I needed to keep momentum. If I stopped for even a second I feared I wouldn’t start again. The last mile or so features more turns than the rest of the race combined. I tried to keep close to the tangents and hoped the next curve, then the next would bring the finish into sight. Finally I could see the line, and I heard JR call out my name from the crowd. I thought I had it, but it would be close. The last .2 I visibly sped up (according to my husband), and I mostly felt relief as I crossed the finish. Then I looked down to stop my watch, which had me at 3:59:53. I made it!! I wished I could have waited at the finish to see when my running buddy of so many miles came in, but the skillful volunteers were herding us quickly through. I filed on to get the particulars – space blanket, water, medal, shirt, red carnation, food – but I couldn’t really relax until I saw the official results. It was still true; 3:59. My smart husband and his friend came to the edge of the gates by the gear bag pickup, cold beers in hand. 🙂 They spotted me as soon as I had my stuff. I didn’t even have to dig out my phone to call. 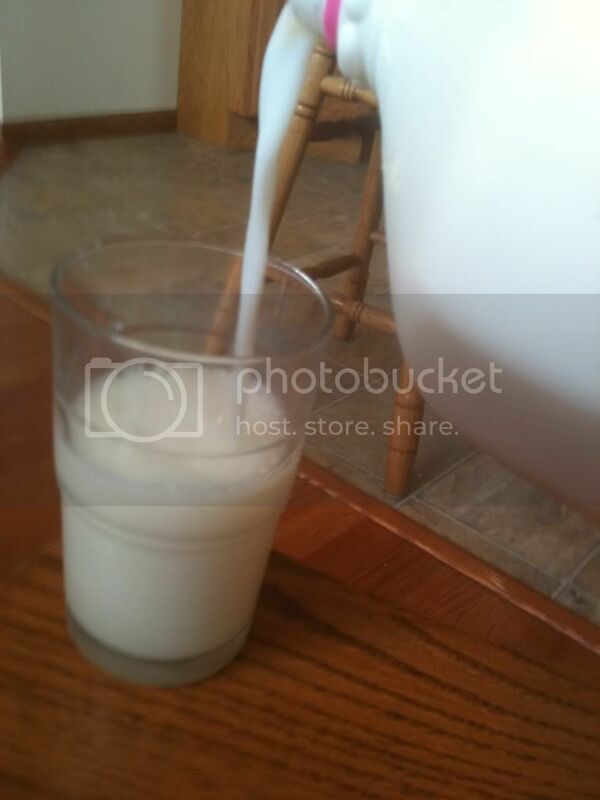 Don’t worry; I drank my chocolate milk too. We eventually secured a patio table for lunch at a restaurant near the finish, then later got coffee to top things off. It had turned into a beautiful, though cool afternoon. We were just starting the walk to the car away from the crowds when we passed a lone individual sitting on the curb. He held a sign proclaiming he was homeless and hungry, but the thing that really hit me was the wistful look in his pale blue eyes. I knew I didn’t have any cash, but I thought about the three bananas in my gear bag. I’d packed enough to share at the start but eaten none. I quickly backtracked, and as I approached the man I asked if he liked bananas. I apologized that they looked bruised from being in my bag, but I said he was welcome to them if he wanted. He answered that “Yes,” he did like bananas, and he thanked me as I handed off the yellow bunch. I didn’t know what else to say, so I just turned around and walked to catch up with JR and John. That was it. I know not everyone seeking help on the street is really hoping for food, and I know three bananas don’t exactly equal a meal. Still, I see there was a reason I packed that extra fruit, and I pray for the man with the pale blue eyes. Duluth is a beautiful, friendly city, and I am so grateful for the second chance it gave me to reach my goal. 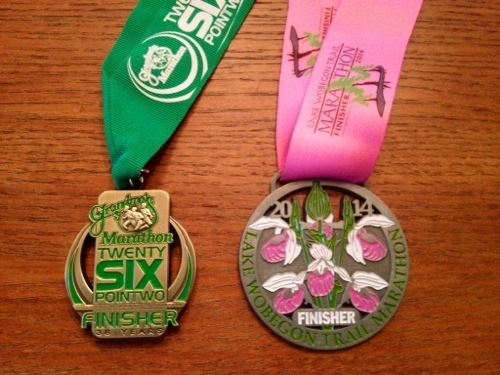 Looking now at my last two marathons, I realize I could not have hit 3:59 without both of them. Last year I ran 4:05 on much less training. I worked harder this year with only a few setbacks, and I admit I thought under four hours was almost a sure thing. 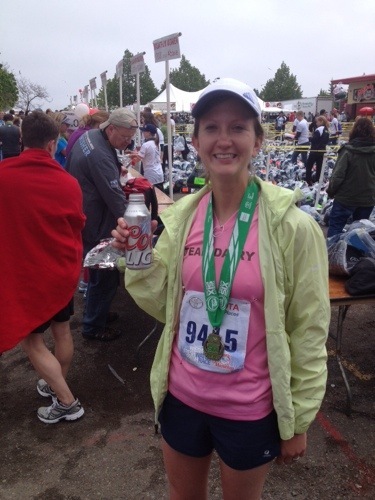 Lake Wobegon was a wonderful race, fun and inspiring, but it taught me not to take marathons for granted. As I look back at my splits, I see in black and white how things only slipped away in the last three miles. For some reason I wasn’t ready for how much it would hurt. At Grandma’s this weekend I was more prepared when my legs felt pinched and tired at twenty. I knew it meant I was working hard like I was supposed to, and then it was time to run with my heart. I’m grateful that God gave me enough heart for the duration. As with most things in life, I now understand the journey and the people involved made the experience far richer and more valuable than the plain completion of the goal itself. Hi, I'm Lisa. Dairy farmer's wife and Minnesotan to the core, I write about rural farm life, running down country roads, and the food, faith, and family that bind everything together. Follow along on my journey. 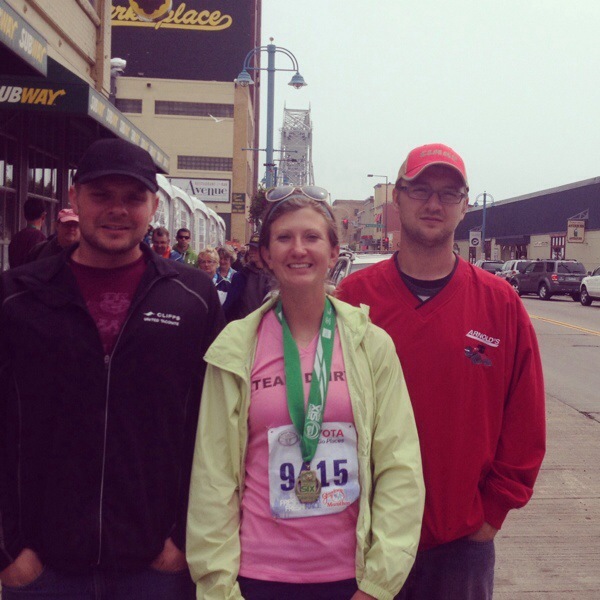 This entry was posted in Race Reports, Running and tagged Duluth, gmas2014, grandma's race report, grandmas marathon, Minnesota runner, MN, team dairy. minnesota dairy farm. Bookmark the permalink. congrats on a great race! It must feel amazing to have a marathon pr in the 3’s now!!! hope your recovery goes smoothly. I will admit I’m pretty happy with that 3! Thanks Katie. Great report! I love hearing all of the details, and I’m so glad everything worked out for you with the race! I know how hard you worked for it and you definitely deserve that sub-4 time! Congrats again! Yay! I’m so glad your redemption marathon really was redemption. Great job. And I’m glad that you can now see even more why God allowed things to happen like they did. Everything really did work out! If I would have met my goal in May I wouldn’t have thought too much about doing Grandma’s – even though it’s been on my race wish list for awhile. I’m so glad I didn’t miss out! Congrats on reaching your goal! It’s difficult NOT to stew over missing a time goal in a race, even for the most positive people (e.g. you). Vindication and celebration all around. 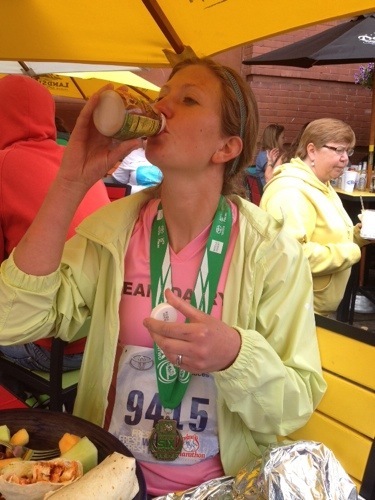 Way to go on the sub-4:00 Lisa! As soon as I heard the e-racer comment I knew it was going in the blog. Thanks for the words of wisdom Blondie! Great report! Wonderfully written. Congrats again. Congratulations Lisa! Way to stay strong and keep pushing to get that sub-4! I bet that man was grateful to get those three bananas. That may have been his only food for the day. You have a kind heart Lisa.